Understanding key signature is essential when playing the fiddle. In music, a note can be sharp, which means it sounds a half pitch (half step) above the original note. The sharped note is represented by a simple ♯ symbol placed to the right of the note. The key signature indicates which notes in a tune are either higher (sharp) or lower (flat) than they normally are. If there was no such thing as a key signature in music, these notes would be the notes you’d play on the fiddle. As you start to learn different key signatures, the finger placements will vary from one key signature to the next. The key signature is always located to the right of the treble clef symbol and contains different symbols that tell you when to change the way you play a note. You’ll see either ♯ symbols, ♭ symbols, or no symbols. If there’s no key signature, the tune is in the natural state of musical notes, or the key of C natural. The notes associated with the key of C are A, B, C, D, E, F, and G.
The A is a space away from the B (this is considered a whole step). The B is right next to the C (this is considered a half step, and your 1st and 2nd fingers should touch each other). The C is a whole step away from the D.
The D is a whole step away from the E.
The E is a half step away from the F.
The F is a whole step away from the G.
The G is a whole step away from the A. 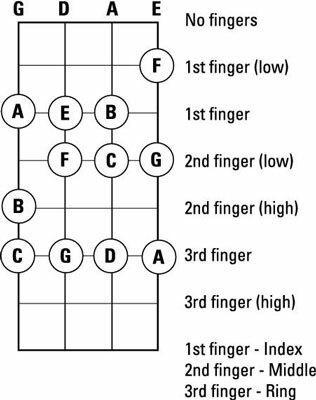 In C major, all the 1st-finger positions are similar, except on the E string. Do you see how the 1st-finger position on the E is lower than the rest? Notice that all the 2nd-finger positions on the D, A, and E are in the same position, but the 2nd finger on the G is in a different position. All the 3rd fingers are in the normal 3rd-finger position all the way across. When you’re playing in a certain key, you should constantly think about where your half steps are because they’re the easiest to miss. For instance, in the key of C, you’re always trying to be aware of the half steps B to C and E to F.
Now if you add a ♯ to the key signature, that raises one note in the musical set A-B-C-D-E-F-G. The change would bring the F a half step higher, to an F♯. So now, the musical set of notes would be A-B-C-D-E-F♯-G. This would change the key from C major to G major. The difference between C and G major is only one note, which is F♯. In C major, the note is just F, while in G major, the note is F♯. This one difference makes certain songs sound a lot different and is very important to understand. The half steps in G major are between B and C and between F♯ and G.
The first thing you should do when you look at a fiddle piece is check the key signature. Understanding the differences among key signatures helps you know exactly where to put your fingers down on the fiddle. Now if you add another sharp to the key signature, you’d have two sharps, which would be considered the key of D major. This is a very common key signature, and it means that you should play F♯ and C♯. 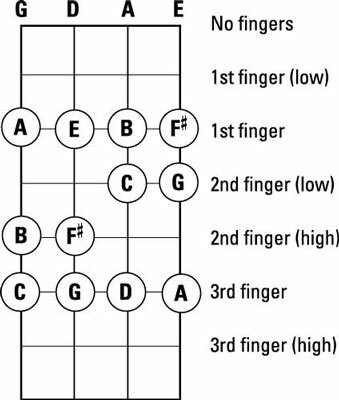 Take a look at the D major finger positions. Look at how things relate to one another. For example, F♯ and G are half steps on the D string, and C♯ and D are half steps on the A string. 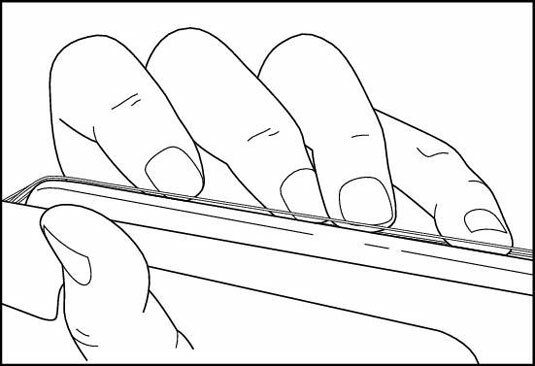 This means that you play the notes very close in pitch, and your fingers should be close together on the fingerboard. When you look at the key signature, you’ll always be dealing with the same order of sharps. For example, if you see two sharps in the key signature, you’ll never deal with anything but F♯ and C♯. Everything goes in order and never changes! The order of sharps is F, C, G, D, and A. Adding another sharp to the mix would put you in A major. This means that you have to play F♯, C♯, and G♯ notes. Do you see how many notes are sharp in this key signature? With A major, it’s important to make sure your 3rd-finger positions are high on the G and D string. You can easily miss this, but it makes the song sound more in tune. When you learn to put your 4th finger (pinkie) down, your high 3 on the G and D should be touching your pinkie. 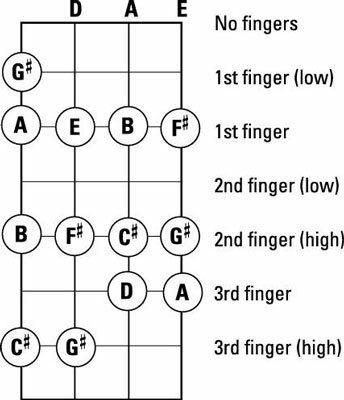 If you don’t understand what is meant by the high 3, look at the G major finger placements, where the 3rd finger is on the G and D string. 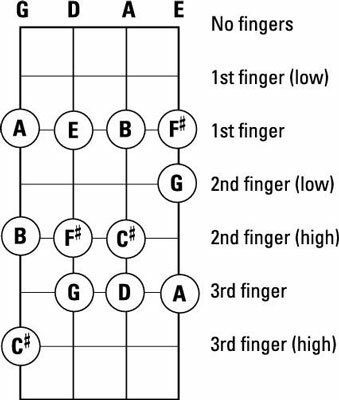 Compare this to the location of the 3rd finger in A major. The 3rd finger on the G and D strings is in a higher position. This is what you call a high 3rd finger. About 99 percent of all fiddle tunes are covered by these five sharps; adding in a sixth or seventh is rare and more common in classical music. If you were to play each one of the notes in the preceding list, they’d sound the same as playing every note on the piano. This would include all the white and black keys, and it’s called the chromatic scale.